Ryokan is traditional Japanese Inn, commonly has public baths or a hot spring. 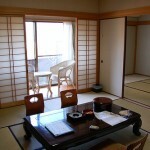 The rooms are Japanese style rooms with tatami and sliding doors. Typically, the chief service manager at ryokan is woman in kimono, who is called okami. She welcomes the guest at the entrance and visits the guests’ rooms to ask if everything is ok.
At ryokan, they prepare yukata for the guests. So the guests don’t have to bring their room wear or pajamas. 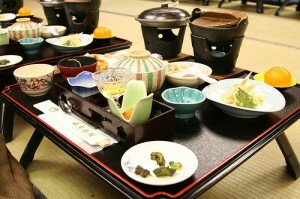 The meals they serve at ryokan are typically Japanese, and the guests can eat meals at their rooms. If you visit Japan, stay at a ryokan instead of a hotel.